As more value is extracted from a vegetable, more pigments or color are also extracted. This is why Champion prepared juice is darker and richer in color when compared to that of a conventional centrifugal-type juicer. This is true whether it is carrot juice, mixed vegetable juice or straight chlorophyll juice such as parsley juice or turnip leaf juice. You can also see it in the Champion-extracted pulp; it is pale in color. The difference in quality is also apparent in taste. Juices extracted by a Champion Juicer are richer and offer a more full-bodied flavor. Designed for simplicity, the Champion Juicer doesn't require nuts, bolts, screws or clamps to assemble. The floating cutter just slides on or off the shaft; a quick half-turn and the body locks on or releases for removal. By changing a single part the juicer is now a homogenizer. It's so simple and all the parts are easy to clean. Powered by a full 1/3-horsepower, heavy duty General Electric motor, the Champion Juicer is powerful, durable and built to last. All juicer parts are made from 100 percent FDA accepted nylon and stainless steel. The Champion Juicer's body is lined with a special stainless steel which is almost wear-free and will not pick up food odor. A special heavy-duty Commercial Champion Juicer is ideal for juice bars and restaurants is also available. If you are overseas, a 220 volt Champion Juicer and 240 volt Champion Juicer are also available. 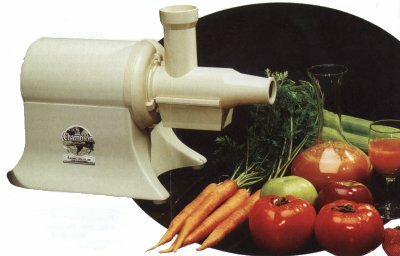 Large Feeding Chamber - 1 3/4 inches in diameter, able to take large vegetables without cutting them into smaller pieces. With the optional grain mill attachment, your champion turns into a grain mill. Now make your own flour, corn meal, coffee, and other dried grain material. Click here for information about this attachment for the Champion Juicer. Recommended if juicing exceeds 1 gallon per day. Juice the celery leaves, then the lemons and apples in the Champion Juicer. Add water to make 1 quart. Serve with ice cubes. Assemble the Champion Juicer for homogenizing and homogenize the frozen bananas. Serve at once. Makes 4 servings.